Leigh Halfpenny is set to be playing his club rugby in France next season. 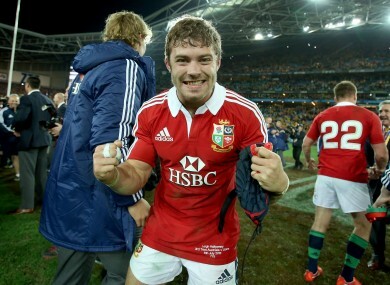 JAMIE HEASLIP MAY not have signed for Toulon yet but La Provence is reporting that Lions team-mate Leigh Halfpenny has. The French newspaper claims Halfpenny agreed the switch after meeting with owner Mourad Boudjellal in London in the past week. The Cardiff Blues player met with owners from three Top 14 clubs earlier in the season, as well as Welsh Rugby Union and Cardiff officials, but appears to have set his sights on a move to the south of France. Toulon are currently in talks with out-half Jonny Wilkinson about the possibility of extending the Englishman’s stay. A say in coaching affairs next season may convince Wilkinson to stay on for a final ‘final’ year. If he does opt to retire, the Heineken Cup champions will have a second, ready-made goal-kicking option in Rory Kockott. The South African born scrum-half will be French-qualified at the end of the season and, this week, declared his intention to honour a pre-contract deal with Toulon. He is currently plying his trade with Castres and will come up against Leinster in the Heineken Cup pool stages next month. Halfpenny was nominated for the IRB World Player of the Year award this month but lost out to Kieran Read. In March, he was named the best player of the Six Nations. He was the starting Lions fullback in their Test Series win over Australia. Halfpenny and his Blues teammates will play in Toulon’s Allianz Riveria stadium on 11 January in a Heineken Cup Pool 2 match. The Welsh side stunned the reigning champions 19-15 at the Cardiff Arms Park in October, with Halfpenny kicking 11 points. Cardiff will now endeavour to retain the playing services of Sam Warburton and Alex Cuthbert. The Welsh region will also lose Robin Copeland, who has agreed to join Munster, at the end of the season. Toulon has been touted as a possible destination for Heaslip after the Leinster and Ireland No.8 back-row visited France to meet with representatives of the club, and those of Montpellier. Email “French media reporting that Leigh Halfpenny has signed for Toulon”. Feedback on “French media reporting that Leigh Halfpenny has signed for Toulon”.